Here is JVC’s new 32 inch LT-32DX7 model LCD HDTV. This unit ihas dual HDMI inputs, and is capable of 720p and 1080i sources. She comes complete with digital tuner. Currently available in the UK, I’m looking forward to some serious reviews. PC mag took HP’s Z556 home theater PC for spin, and they really liked the results. The HP Digital Entertainment Center z556 is cheaper than its predecessor, the z555 and includes Windows Media Center Update Rollout 2, which improves the Media Center experience. The system remains the standard for home-theater-friendly Media Center PCs. This unit has one HD and 2 SD tv tuners. That’s the only problem I really see – no PVR functions for HD with only one tuner. If that’s not a major issue for you, this $1500 unit may be for you. 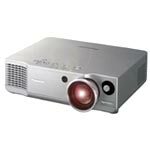 Henning over at HDBlog found a great deal on the Panny PT-AE900U projector through Visual Apex. You get the projector with a 2-year warranty, plus a bonus blockbuster rental card for $1548 after rebate. This projector normally runs around 2 grand, so that is a steal. Pre-order is now available for the next generation of DVD players – the HD DVD player from Toshiba. Several online merchants are currently taking pre-orders at $500. DISH network is to add several more HD channels to their lineup, bringing the total to 25 HD channels. Expect to see 5 more VOOM HD channels, ESPN2 HD, Universal HD as well as adding local major network affiliates (CBS, NBC, FOX, etc.) in many markets. The addition is scheduled for February 1st. and Major Network Affiliates where available. That’s the best HD lineup I’ve seen yet, I may just have to drop my cable provider. Vist Dish Network to find out more. Ecoustics ran this Sony 7100ES through its paces, and found it a bit lacking in the setup department, as well as being light on the audio side. But still, it seems a decent entry in the sub 2 grand category. “The Sony STRDA7100ES has, at its core, all the right moves: seven channels of raw power, all of the latest surround sound decoding options and HDMI capability wrapped in a shiny silver casing worthy of boutique style electronics. Add to that equation its sub-two-thousand-dollar price tag and you’ve got a receiver with a lot going for it. But in all the areas it succeeds, it falters where others have shone. Budget plasmas from Vizio have become rather popular lately, with decent to good performance for the money. You can spend a bit more and get more features coupled with a better quality image, but this is a great way to get into plasma now.